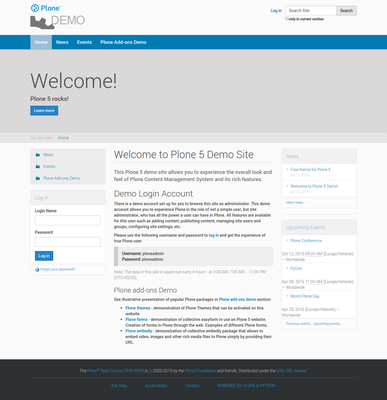 Try out Plone 5 on our new demo website. Plone 5 comes with a lot of enhancements, greater flexibility and control. You can “touch and feel” new features by going to http://plone5demo.quintagroup.com/. Demo website has account that gives users rights and permissions of site administrator. This user role provides access to all Plone features, such as adding content, publishing content, managing site users and groups, configuring site settings, etc. Plone 5 became faster. Now it uses Chameleon template rendering engine that reduces rendering time by 30%. New features and functionality you can experience with Plone 5 and on our demo website are listed below. The new default theme is called Barceloneta. It is responsive out of the box and compiled with LESS. Diazo themingis enabled by default, so this theme can be edited through the web. Plone 5 uses HTML5 and allows choosing front-end framework, like Bootstrap. The content management toolbar was redesigned and now users can manage content using pull-out panel. It can be expanded from one icon to full toolbar and repositioned. It is separated from content for easier styling, so users can always see a correct view of the pages. TinyMCE became more accessible and mobile friendly. Drag&drop uploads and content reordering are now also available. Dexterity content types are now used in Plone out of the box. Products.Archetypes, Products.ATContentTypes, archetypes.schemaextender are available as add-ons, mainly for older content. For instance, content migrations can be customized with a help of schema extender. Multilingual functionality is now shipped with Plone by default, so you can always translate your content and keep translations in order. Plone was always known as the open source CMS with the strongest security available. Plone 5 can boast automated Cross Site Request Forgery (CSRF) and click-jacking protection. Security levels can be customized based on the needs of particular website. Use our demo site for experimentation. Although this Plone version is a pre-release, experienced developers can implement Plone 5 based solutions. Contact us if you are interested in Plone development.